Chia-Chien Chang's research engages questions at the intersection of international political economy and security, with a specific focus on the interactions of finance, crises and war. 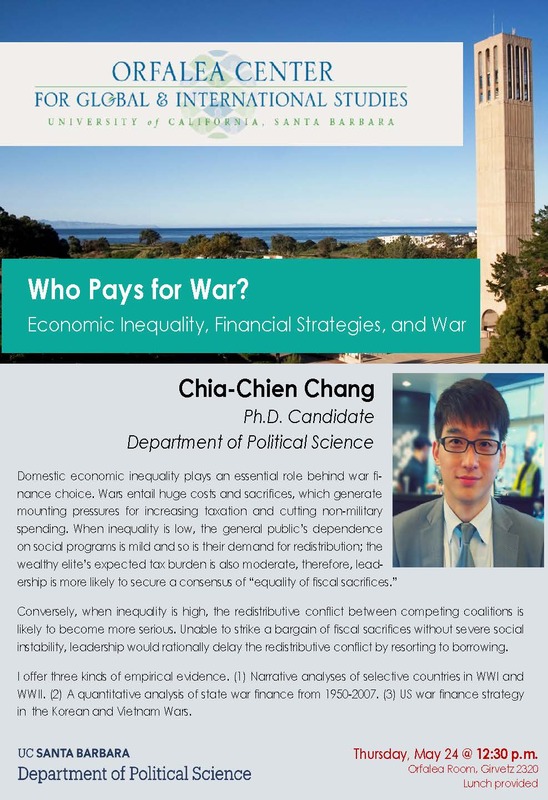 His dissertation utilizes both quantitative and qualitative methods to show how domestic economic inequality and states’ war finance strategies affect their engagement in war as well as the outcome of intra-war bargaining. Conversely, when inequality is high, the redistributive conflict between competing coalitions is likely to become more serious. Unable to strike a bargain of fiscal sacrifices without severe social instability, leadership would rationally delay the redistributive conflict by resorting to borrowing. He will offer three kinds of empirical evidence. (1) Narrative analyses of selective countries in WWI and WWII. (2) A quantitative analysis of state war finance from 1950-2007. (3) US war finance strategy in the Korean and Vietnam Wars.